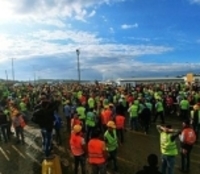 The second hearing of 61 workers, who staged a protest against their bad working conditions and occupational homicides in the construction of the 3rd Airport in İstanbul and 1 of whom has been arrested pending trial, was held at the Gaziosmanpaşa 14th Penal Court of First Instance today (March 20). The second hearing of the case was again held at the dining hall of the courthouse due to the low capacity of the courtrooms. In the first hearing of the case on December 5, 2018, Ayhan Arduç, the Acting Judge of the court, rejected the requests for immediate acquittal raised by the attorneys of defendants, heard the statements of defense presented by the arrested and non-arrested workers and ruled that 30 of the 31 arrested workers shall be released on probation. In the second hearing of the case held today, the workers who did not present their statements of defense in the first hearing were heard. The hearing was watched by not only the families of the workers, but also several journalists. Armed police officers were on duty in the courtroom. Announcing its interlocutory judgement, Presiding Judge of the court Elif Tanyeri Özgilik has ruled that the judicial control measures previously imposed on the released 30 workers shall be lifted. The next hearing of the case will be held on June 26, 2019 at 9.30 a.m.
On September 14, 2018, workers of the 3rd İstanbul Airport staged a protest against their bad working conditions and occupational homicides. At the same night, the dormitories of the workers were raided by security forces and 401 workers were taken into custody. 31 of the detained workers and unionists were arrested. İmamoğlu: What Do You Want? To Count the Votes or Not? What is Your Purpose? Comments Off on İmamoğlu: What Do You Want? To Count the Votes or Not? What is Your Purpose?